Asni the Harper performs and improvises on medieval, renaissance and baroque harps. Her performing career has taken her all across Europe and the US, before she took up a teaching position at Victoria University Wellington and settled in New Zealand. In 2008, after releasing her second solo album "Travels in Middle-earth", she decided to retire from the stage and concentrate on her web design, illustration and multimedia work. 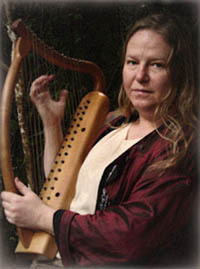 Her CD albums and a range of sheet music suitable for harps and other early instruments are available in her online shop. She still performs live once a year at the medieval market in Levin, and occasionally writes and records music. Please go here to enquire about performance, public talks, or private teaching.